April saw me at two comics conventions. My plan for the rest of the year is too make at least two such appearances a month as I barrel my way towards my December birthday and reaching the ripe old age of 65. Time flies when you’re having life. I want to thank Jesse Noble and Joe Nieporte for inviting me to Gem City Comic Con in Dayton, Ohio, and FantastiCon in Toledo, Ohio. I had a wonderful time at both of their events and hope to return to them in 2017. At the end of this week’s column, I’ll fill you in on my May appearances. 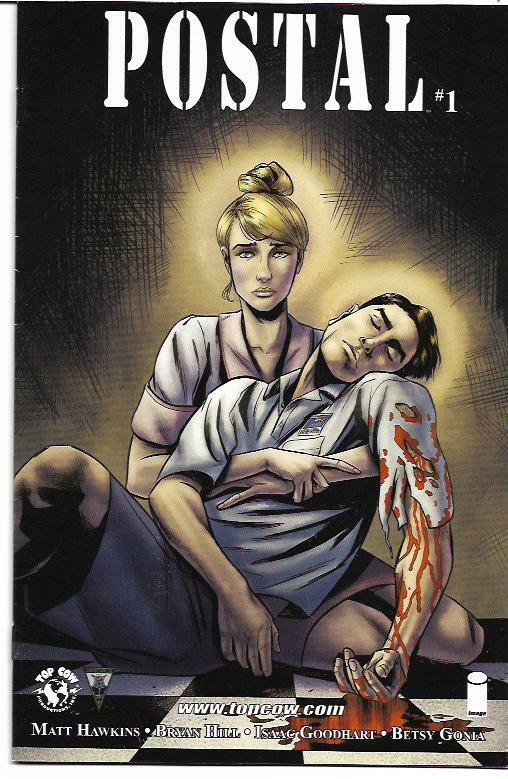 My pick of the week is Postal [Top Cow/Image; $3.99 per issue]. The ongoing series was created by Matt Hawkins, written by Bryan Hill and Hawkins until Hill went solo around issue #10, drawn by Isaac Goodhart and colored and edited by Betsy Gonia. There are echos of Fargo and Twin Peaks in the series, but it definitely stands on its own as among the most unique titles in the modern age. It’s a town for final chances. A place to disappear to have a life unconnected to your past crimes. Some of its residents have served their time. Others are fugitives. All are under the rule of Mayor Laura Shiffron, whose murderous husband founded the town and ran it until Shiffron and others hung him from a tree. Which didn’t kill him. In a town of criminals, he was the most vicious and he’s not down with Eden yet. Mark Shiffton is the mayor’s son and its postman. He is said to be “a textbook case of Asperger’s Syndrome.” His difference makes him an amazing detective and, in the series to date, he’s used his gift to help people and uncover Eden”s secrets. If they gave out Eisner Awards for best new character, he would have gotten my vote. Then again, Hawkins and Hill should be lauded for their handling of the character. The writing on this series has been first-rate since the first issue, with each issue making me all the more eager for the next issue. Goodhart and Gonia deliver visuals worthy of the writing. Just one example of their amazing skill is how they depict the many faces of Maggie Prendowski. The town’s friendly waitress was a drug dealer and perhaps worse. She’s the informant and plaything of a crooked F.B.I. agent. She’s a romantic interest for Mark and, even in this town of false faces and secrets, I think she honestly cares for the postman. Two trade paperback collections of Postal have been published with a third due out in June. I recommend them highly. Pre-Code Classics: Ghost Comics Volume 1 [PS Artbooks; roughly $45-50] is one of the more disappointing books in this ongoing series collecting horror comics of the 1950s. It reprints the first seven issues of the Fiction House title from 1951-1953. The quality of Fiction House titles is generally inconsistent. It took years for Planet Comics to become a worthwhile title. With its material coming from the Jerry Iger Studio, Fiction House’s writing and art was dependent on who was working for Iger at the time. Some of the writers and artists were very good, others were at the other end of the spectrum. 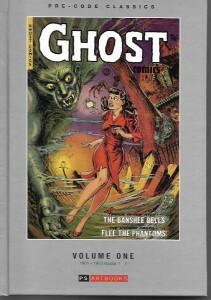 This factors into Ghost Comics because most of the stories in these first issues are reprints from earlier Fiction House titles like Jumbo Comics, Wings Comics and others. Adding to the unsatisfying experience is that the reprints were often cut by two to four pages for the reprinting. The high points of this collection are the Maurice Whitman covers. There are several stories drawn by Lily Renée, whose work I like, Jack Kamen, Rafael Astarita, and the interesting team of penciler Bill Benulis and Jack Abel. The Benulis/Abel stories may not have been reprints since the Grand Comics Database doesn’t identify them as such. Though some of the “Werewolf Hunter” stories are creepy in a good sense, most of the writing is so-so. Also amusing are a few reprinted stories in which Nazis have become Commies. One must keep up with the villains of the day. Even when I don’t particularly enjoy a Pre-Code Classics volume, I know there will be comics fans and historians thrilled to have them available. Though I sometimes sell the volumes I don’t like, I do not regret buying them. I love the thought of reading comic books I would never otherwise get to read, even if they are far from the best of the era’s offerings. If you share that with me, then you’ll also be glad for this and other volumes. I read quite a bit of manga, though it’s only a drop in the bucket of what’s available. Of late, I’m drawn more to relationship tales than the action stuff, which I often find repetitive. Interesting characters are what I like in manga and what I strive for in my own comics writing. 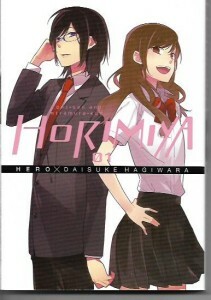 Horimiya Volume 1 by HERO and Daisuke Hagiwara [Yen Press; $13] is a relationship comedy. Kyouko Hori is one of the most popular girls at her school, but almost never joins her classmates for abt after-school activities. With her parents constantly traveling for their respective jobs, Hori heads straight home to take care of her kid brother and their house. In a sense, she had dual identities. She is an admired star at school and a plain Jane housekeeper and nanny the rest of the time. Izumi Miyamura is the opposite. At school, he appears awkward and gloomy and shy. Underneath his plain exterior, he’s a hot guy with piercings and tattoos. One of his daily challenges is to keep his other self hidden from his fellow students, which is not easy when it comes to activities like swimming. The paths of the two students, opposites in their dual identities, cross. They learn that there are many sides to every person and to every story. They connect and becomes friends. For lack of a better word, it’s a pleasant story with some tense moments and surprises. The writing is solid and the art is lovely. If subsequent volumes are as enjoyable as this one, I’ll keep reading them. If you’d like to meet me, get an Isabella-written comic book signed or just talk comics, I’ll be making two public appearances in May. On Saturday, May 7, aka Free Comic Book Day, I will be at Toys Time Forgot in Canal Fulton, Ohio. Two weeks later, Saturday, May 21, I am a special guest of the East Coast Black Age of Comics Convention in Philadelphia. I would be very pleased to see some of my “Tony’s Tips” readers at these events. I have no one “pick of the week” for you this week. Instead, I have a three-way tie for that honor. It’s a good week. Operation Ajax: The Story of the CIA Coup that Remade the Middle East [Verso; $25.95] was published last August. It’s a history in comics form with credits like those in a movie. A Cognito Comics & Verso Books production. Written by Mike de Seve. Edited by Stephen Kinzer. Created by Daniel Burwen. Adapted for comics b Mike de Seve and Jason McNamera. It’s a comics work that will not set well with many readers, introducing them as it were to history which has been routinely ignored by the media and political presentations of the factors and forces that created the turbulent region as we know it today. It is not an easy read. The story opens in 1953. We get a “cast of characters” at the front of the book, but all are brought to unflinching life as the history unfolds. It starts with the oil, of course, and the fading British empire’s need for it or, more precisely, the power and influence it holds as a result of its control of that commodity. The rightfully revered Winston Churchill is a key player in what was certainly not his finest hour. 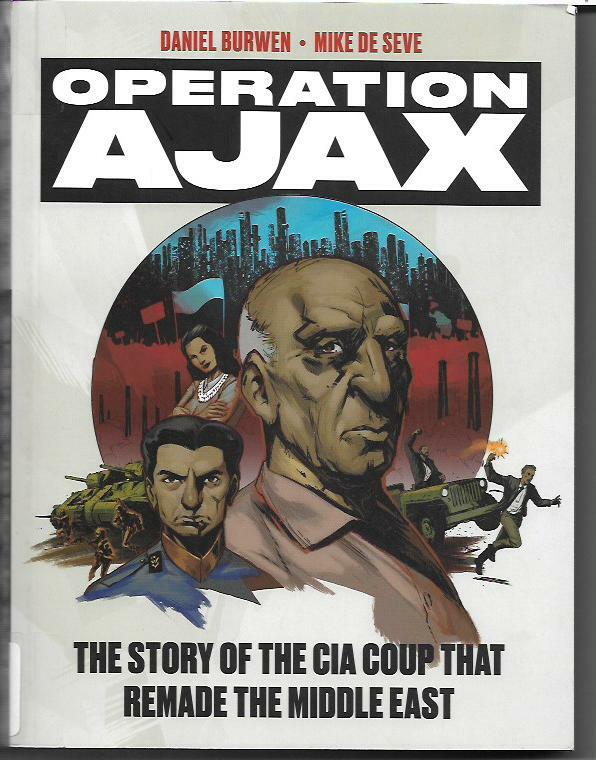 As I said, Operation Ajax is a hard book to read. It will not sit well with those who try to reduce the Middle East conflict to such inane statements as “They hate our freedoms” or “Islamic terror.” Certainly they are those who hate our freedoms. Certainly there are those who use “religion” as a front for their own lust for power. But the creation and evolution of the ongoing crisis is not easily or accurately reduced to those talking points. De Seve is an Emmy-nominated writer and director who has worked for major studios on major animation projects. The book has a cinematic feel to it that serves the telling of this history well. We get the story in chapters, each with its own brief introduction. This makes the complicated history easier to grasp. There’s a foreword at the front of the book and historical materials at the back of the book that add to the understanding of uncomfortable truths. However, it is the sure writing and expressive art that brings the reader into the times in which this history happened. I admire the craft and the honesty and the intensity of Operation Ajax. I recommend to comics readers as an example of what our art form can accomplish, to those of us who struggle with the complex realities of our times and to libraries committed to serving their patrons well. 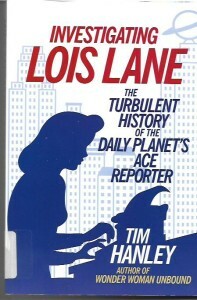 Tim Hanley’s Investigating Lois Lane: The Turbulent History of the Daily Planet’s Ace Reporter [Chicago Review Press; $18.95] is more than just the facts, m’am. While it is a meticulously-researched, almost obsessively-sourced biography of one of fiction’s best-known journalists, the book’s insights into the presentation of Lois by almost exclusively male editors, writers and artists offer insights valuable to anyone making comic books at a time when female readers are the fastest-growing part of our audience and as female creators are becoming more and more prominent in our field. Hanley shows us all the many aspects of Lois Lane. In this history, we see her as the “sub sister” wanting to fight for scoops with the boys. We see the feisty reporter who will risk life and limb for story. We see the petulant diva who can’t see what hides behind the glasses of a fellow reporter. We see the subdued woman conforming to the times. We see the unruly child who must be taught lessons, often painfully, by the men in her life. We see the feminist icon fighting for social justice. We see the strong partner in both love and work. So many different versions of Lois Lane. Hanley makes his most useful contributions to the conversation when he points how often – and to the detriment of the character – Lois is simply there to advance Superman’s story. It makes me consider how often that is done with both female and male supporting players and how I might address that in my future comics writing. Anything that forces me to rethink my art and craft is going to rate pretty high with me. Investigating Lois Lane is a must-read for comics fans, historians and creators. I recommend it highly. Once a mystery is put before her or a question asked, Trine knows the solution to the mystery and the answer to the question. Though she doesn’t know how this ability came to her, Trine utilizes it to help people and to make a living. She doesn’t know what hasn’t been put before yet, but, everything else, yeah. She knows. Trine is a likeable, relatable hero. Artist Alberto J. Alburquerque makes her real and is equally swell at creating a London that feels right to me. Colorist Marissa Louise uses her hues to work with the story and support it. This comic book, of which I have now read the first three issues, is the complete package. The more-or-less street level mysteries give way to a case that has more global consequences. This feels like a natural progression and it’s further evidence of Tobin’s skill. He’s become a writer whose work I will always check out. 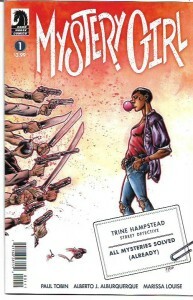 Mystery Girl Volume 1 [$12.99] will collect the first issues of the title. It’s scheduled to hit stores in July. Even though I bought the single issues, I’ll still be buying the trade. Mystery Girl is not just a keeper. It’s a keeper to be shared. My interest in pre-code horror comics was sparked decades ago when science fiction and fantasy author Lawrence Watt-Evans wrote about them for the weekly Comics Buyer’s Guide. I was fascinated by the subject, but pre-code horror comics were hard to come by in those days. Some EC Comics horror stories had been reprinted in various formats and Marvel’s black-and-white and color horror comics from the 1970s were reprint some of that company’s scary tales from the 1950s, but that was pretty much it. Today, with so many pre-code horror comics entering into the public domain, publishers like the UK’s PS Artbooks have been collecting entire runs of some pre-code titles in reasonably-priced hardcover editions. Shot from the original comics and sadly lacking any sort of historical context to the reprints, these books are still worth their fifty-bucks-or-so price tags. Just be warned that not every pre-code horror comic is as good as the issues published by EC, or worthy runner-ups like Marvel/Atlas and ACG. 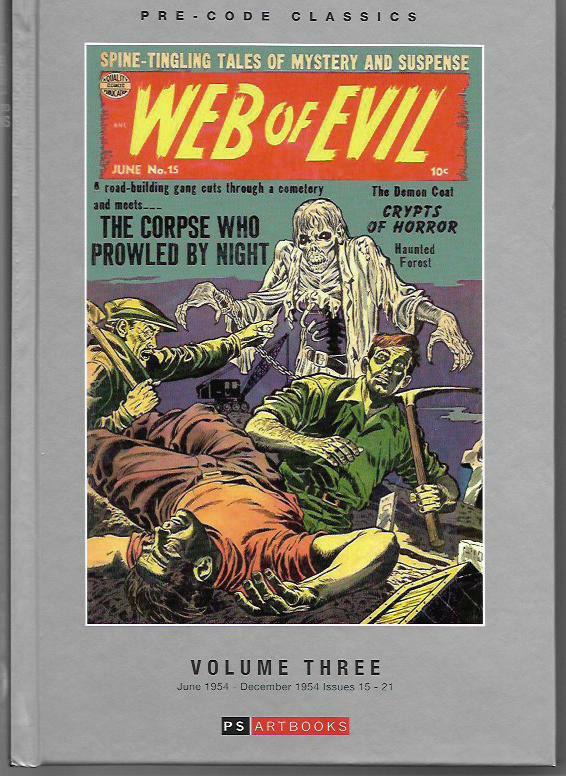 PS’ Pre-Code Classics: Web of Evil Volume One through Three reprint the entire 21-issue run of the Quality Comics title from November 1952 to December 1954. I reviewed the first volume a couple months back, but now I have all three to consider. Quality was, indeed, a quality publisher. Their biggest hits were Blackhawk and Plastic Man. They reprinted Will Eisner’s The Spirit and, simultaneously, published the adventures of a knockoff name of Midnight. Other notable Quality heroes included Uncle Sam, the Ray, Dollman, Phantom Lady and the Human Bomb. In the teen humor genre, Candy, which I collect when I can afford to, is one of the best of the Archie imitators. I also love The Barker, a quirky series about a traveling circus/carnival. Horror was not a comfortable fit for Quality, but comics publishers were competing against the great many other publishers who entered the field after World War II and the lure of other entertainments. Sales were declining and no genre was off the table if there was a chance it could sell. Quality never went in for the excesses that some of their rivals embraced, but their horror comics didn’t stand out in any way. Plastic Man creator Jack Cole contributed to the earliest issues, possibly writing his own stories. I have described his art on these tales as “boisterous” and “dizzying,” but his work was more so on Plastic Man and on rival publisher Lev Gleason’s Crime Does Not Pay and Daredevil. To date, comics detectives have not identified the other writers who contributed to Web of Evil. The stories in Web of Evil feature a mix of vengeful spirits, men pretending to be vengeful spirits, supernatural creatures, science gone horribly wrong and the like. In addition to Cole, Web’s better artists include Charles Cuidera, Charles Nicholas, Harry Lazarus, Sheldon Moldoff and an effectively moody Louis Ravielli. Web of Evil #20 [November, 1954] is my favorite issue of the title. Cover story “The Monster from the Deep” lifted some of its better moments from the classic 1953 movie The Beast from 20,000 Fathoms. “Katumba – The Man-Made Terror” invokes King Kong with its tale of two crooks and their fake monster. “Make-Up for Horror” is a real chiller about a make-up artist whose unusual techniques bring him both fame and ruin. We even get a mummy in “Death from the Tomb.” I was on the fence as to whether or not I was going to keep these three volumes – I’ve sold some pre-code horror collections I didn’t care for – but this issue earned them a place in my comics library. 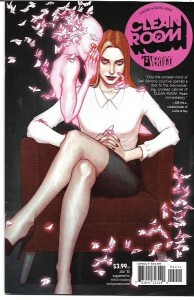 Gail Simone’s Clean Room [Vertigo; $3.99] per issue is possibly the most unsettling comics series I’ve read this year. It kicks off it Germany with an apparently possessed truck driver running over the young Astrid Mueller. Twice. Astrid grows up to start a cult-like organization that’s even scarier than Scientology. Astrid is one of two protagonists in this series. I use “protagonist” instead of “hero” because I’m not certain where either Mueller or reporter Chloe Pierce sit on the whole good/evil chart. That’s part of why I’m intrigued by and enjoying this series. Six issues in and I am not sure what’s going down and if I have a horse in this possibly humanity-ending race. Some writer that Simone. Chloe is a sympathetic character, trying to get past her husband’s suicide – he was investigating Mueller – and her own recent attempt at suicide. Chloe is tough and vulnerable, but more the former than the latter. She may have powers that are just now developing, which makes me wonder if Mueller wants to work with her to save humanity or use her for Astrid’s own ends. Some writer that Simone. Sidebar. Chloe has these neighbors. Very gentlemanly and perhaps a bit slow. I love them a lot. Some writer that Simone. Artist and colorist Jon Davis-Hunt brings the right atmosphere to the book. His character designs are excellent and his storytelling is top-notch. The right artist for this series. I’ve read the first six issues of Clean Room and I look forward to as many more as it takes to tell this story. Those issues will be collected in Clean Room Vol. 1: Immaculate Conception [$14.99] in June. That’s a book you’ll want to read. My pick of the week is Will Eisner’s The Spirit [Dynamite; $3.99 per issue] by writer Matt Wagner, artist Dan Schkade and colorist Brennan Wagner. Modern comic books don’t seem to have any interest in short stories, so you won’t see anything like Eisner’s classic tales here. Instead, you get a big sprawling story that takes place in Central City and several foreign ports. 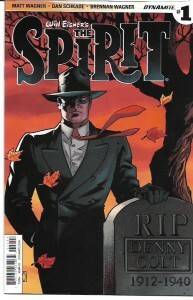 When the series opens, the Spirit has been missing for years and is presumed to have been killed by one of his many enemies. Former sidekicks turned private detectives Sammy Strunk and Ebony White are trying to find out what happened to the Spirit while the Dolan family are trying to move on with their lives. There is all kinds of criminal and political intrigue going on in the city. The danger only increases when a definitely alive Spirit returns, raising even more questions. It’s a fun story, seasoned with appearances of old friends and foes. Nine issues into the series, writer Wagner is maintaining a sweet Eisner ambiance to the stories while Schkade does the same with the visuals. I’m enjoying this series a great deal and so recommend it to all of you. My pick of the week is Black Lightning [DC Comics; $19.99], which collects the stories from Black Lightning #1-11, Cancelled Comics Cavalcade #1 and World’s Finest Comics #260. These stories, mostly written by yours truly with two by the legendary Dennis O’Neil and mostly drawn by original series artist Trevor Von Eeden, have never been reprinted since their original appearances from 1977 to 1979. Okay, if you want to quibble, Black sLightning #1 was reprinted at reduced size in a DC digest magazine during that period, but that’s it. Unless you read these stories in their original publications, they will be new to you today. 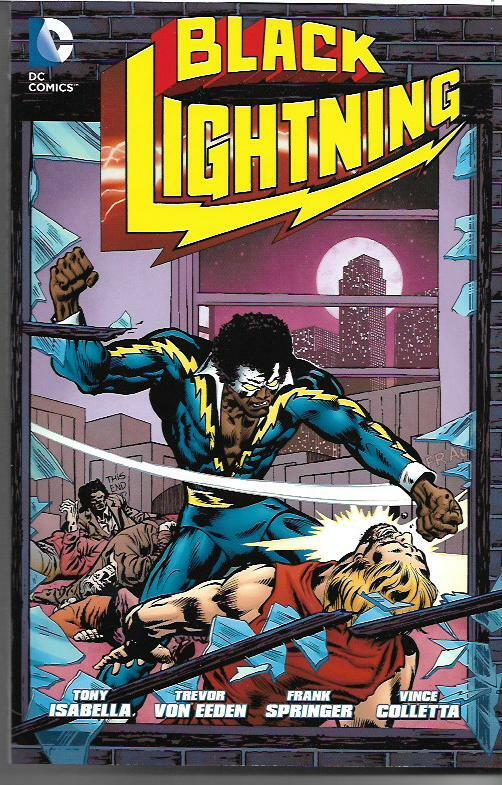 When I created Black Lightning, it was the not-quite-culmination of a personal quest to create an inspirational African-American super-hero who readers black and white, young and old, could relate to. My quest was born of my longing for simple fairness, long before I heard and embraced the term “diversity.” I had black friends who read comic books and they didn’t often see themselves in the comic books they read. I thought that was wrong. So when I got into the comics industry in 1972, I wanted to do something about it. I got my training at Marvel Comics under the tutelage of Stan Lee and Roy Thomas. I was privileged to be part of an amazing bunch of writers which included Gerry Conway, Steve Englehart, Steve Gerber, Don McGregor, Len Wein and Marv Wolfman. When I moved to DC and new challenges, fate and two questionable scripts by another writer gave me a rare opportunity to make comics history. But you can read all about that in this collection’s new introduction. Jefferson Pierce: a man who came home and found that home in the merciless grip of the 100. Now he fights the mob on two fronts, in the classroom as a dedicated teacher and in the streets as the dynamic…Black Lightning! In these stories, you will see Black Lightning accept the mantle of super-hero while contending with ruthless mob-boss Tobias Whale and minions such as the Cyclotronic Man and Syonide. You will see him meet such classic DC characters as Inspector Henderson, Jimmy Olsen and Superman. You will see the earliest work of future super-star artist Trevor Von Eeden. When a writer reads stories he wrote four decades ago, he’s putting his ego at risk. Long-forgotten flaws in the work leap out at you. But, at the risk of sounding immodest, I think these stories hold up pretty well. There are moments that make me proud, such as when Black Lightning explains to Superman why he can do what Superman cannot do or when Jeff Pierce makes peace with his past. There are thrilling action sequences, tragic losses and joyous victories to be had. I’m proud of this work and I hope you’ll find enjoyment and merit in it as well. And to other men fear. Thanks to Den Didio, Geoff Johns, Paul Santos and other DC folks, the hopes I had for this creation live on. Their respect for Black Lightning and my work is genuine and welcome. These old tales could represent a new beginning for Jefferson Pierce and what he stands for. I invite you to join the dream. Welcome to the new comics industry. Sisters are continuing to do it for themselves and I’m extremely glad for it. As regular readers of this column know, many of my favorite super-hero and other comics star female characters and are often written and drawn by talented creators who happen to be women. Danvers) commands the Alpha Flight space station, an early warning and defense station protecting our planet from alien encounters of the unfriendly kind. That the first issue of the new series was also the first comic-book script for the duo boggles my mind. It’s the equivalent of hitting a home run in your first at-bat as a professional. Maybe not a perfect out of the park homer, but a home run just the same. Carol is everything a super-hero should be. Human and super-human. We can relate to her frustration at the bureaucracy involved in her new job while admiring her leadership chops. The use of the Alpha Flight characters is a little problematic for me – Puck asking for Carol’s autograph, the seemingly unnecessary mention that Sasquatch and Aurora were once romantically involved – but I’m intrigued by other supporting cast members as well as the mini-Babylon 5 vibe of the station’s dealings with various extraterrestrials. Two issues in and I’m hooked. 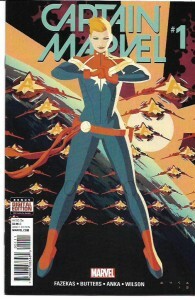 Captain Marvel looks and reads well with solid art by Kris Anka and colors by Matthew Wilson. If you’ve enjoyed other super-hero titles I’ve recommended, you’ll enjoy this one, too. 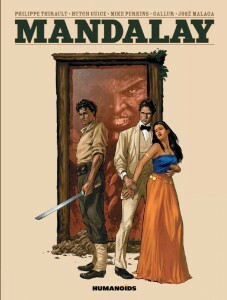 Mandalay by Philippe Thirault with art by Butch Guice, Mike Perkins and others [Humanoids; $39.95] is a dark and exciting adventure set in colonial Burma in the 1940s. It’s the tale of twin brothers who find themselves on opposite sides of conflicts between the Burmese and their British occupiers, between the British and the invading Japanese and between their passions for the same woman, with all of these situations inflamed by dark powers released from an ancient, cursed city. Published in a glorious, hardcover, oversized edition, Mandalay is 188 pages of excitement, horror, romance and tragedy. Once I started reading the graphic novel, I couldn’t turn its pages fast enough…and then I went back to savor them again. Mandalay almost slipped under my radar, but a brief online mention led me to it. The story is compelling with an ending that is both satisfying and wonderfully unnerving. The Guide/Perkins are is top-notch, as are the forty or so pages drawn by other skilled artists. It’s the kind of book that makes me want to seek out other comics work from Europe. Read it and see for yourself.